TNC "CM" & Titanium Needle(02) - Triumph Needle Corp. 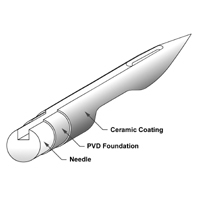 The TNC CM needle combine the "PVD" high Tech and Ceramic coating technology in the needle surface, so the TNC CM needle are not only have a very good attrition resistance but also have a very low friction coefficient. The study show that the TNC CM needle have better performance than conventional needle in all kind of sewing process. 20% less melting point in synthetic fabric sewing. Lower adhesion of melt residues on the needle. 3 times longer life of the needle tip. Less skipped stitches and thread breakage.